Glassfibre Reinforced Concrete or GRC (sometimes called Glassfibre Reinforced Cement and Glass Fiber Reinforced Concrete or GFRC), and known around the world by various names such as Composite Ciment Verre or CCV, Fiber Beton, Fiber Takviyeli Beton and Glasfaserbeton or GFB, is a mixture of cement, fine aggregate, water, chemical admixtures and alkali resistant glassfibres. 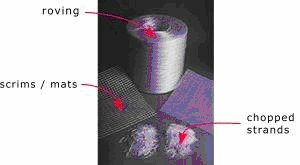 Since its introduction 50 years ago in the 1960's, GRC has matured and today's designer has available to him, depending upon his performance requirements, a range of matrix modifiers such as acrylic polymers, rapid set cements and additives to improve the long term stability of the material. Extensive independent test and performance data are available on all aspects of matrix formulation. 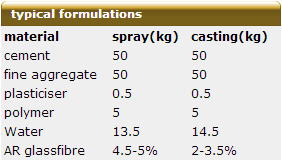 The Alkali Resistant glassfibre is generally used at the 2-5% level in the manufacture of factory finished prefabricated products either by the spray process or using traditional concrete casting methods. It is also used in the 1-2% range for reinforced renders as a site applied mix and can also be used to control plastic shrinkage cracking, microcracking and bleeding of site-cast concrete.